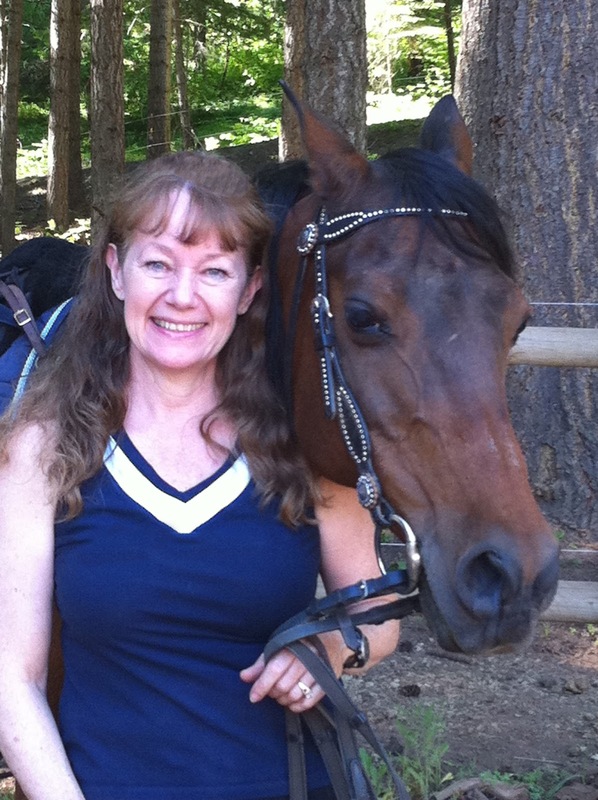 Heroes, Heroines, and History: Old West Trail Rides & Win a Book! Old West Trail Rides & Win a Book! How would you like to follow in the footsteps...er...hoof-tracks, of some of the famous characters from the Old West? Most of my books are historical romance featuring cowboys in the West, but my newest book is Blue Ribbon Trail Ride, a horse novel for kids. So I decided to combine the two and see what I could find in the way of trail rides you might be able to take today to revisit places in the Old West. I don't know about you, but I think it would be a blast! You get an entire different perspective from horseback. The five-day historic Tombstone, Arizona horseback ride and tour will focus on Wyatt Earp’s Vendetta Ride of March/April 1882. This most successful and ever popular Old West horseback ride traces Wyatt Earp and his posses’ bloody trail of retribution against the Cowboy faction just after Wyatt’s younger brother Morgan was back-shot to death while playing pool at Campbell and Hatch’s billiard parlor on Allen Street. An earlier attempt on the life of older brother Virgil by the Cowboys left him with his left arm maimed and useless for life. Later, you'll take a full day ride into the Dragoon Mountains and Cochise’s Stronghold and Council of Rocks. Another full day’s ride to Iron Springs in the Whetstone Mountains where Curly Bill Brocius was killed … or was it Cottonwood Springs? You decide the controversy!! Few folks have been here!! Johnny Ringo’s supposedly haunted gravesite in the Chiricahua Mountains. Locations along the San Pedro River, sites such as Charleston and/or Fairbank — all frequented by the Cowboy’s & Earp’s… gives one a perspective of the riding distances Wyatt and his posse took. 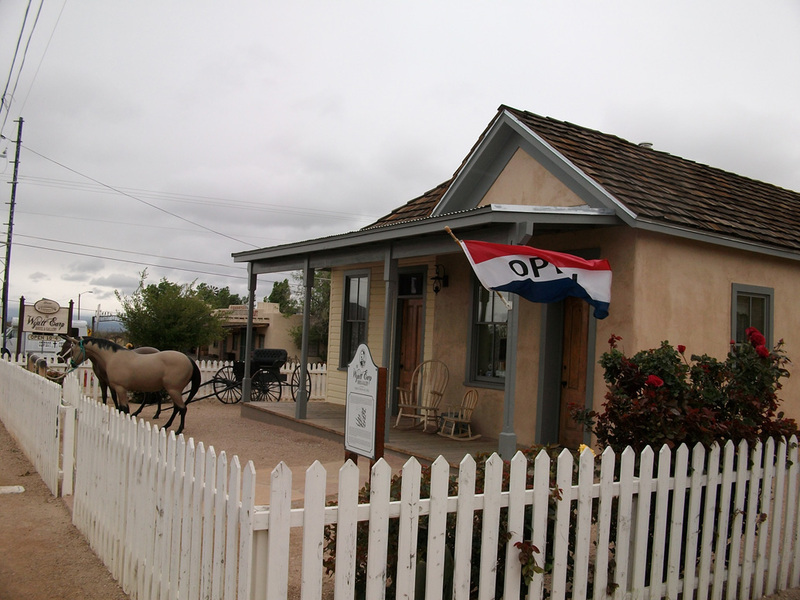 Private tours of Tombstone, the OK Corral, and more conducted by renown Tombstone historians. 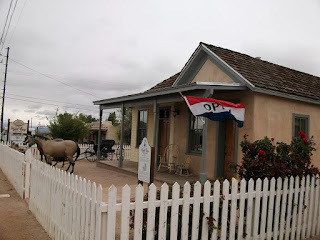 Finding Love in Tombstone, Arizona, encompasses some of this same territory, and it would bring it to life for me even more to take a trip like this. I'm a history-a-holic, if there is such a thing! on a hard seat. Okay, so I'm exaggerating a little, as the one I found features two and four hour trips along a section of the Oregon trail, so most of us could probably tough that out, but they also offer three and five day trips. 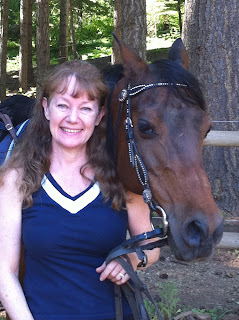 I think I'd prefer to be in the saddle--how about you? A trip like this would certainly give us a small taste of life on the trail as they knew it. taken a trip across country on horseback to experience history come alive? I'd love to hear from you! Or do you have a dream to do one of those things or something like it someday? Leave a comment with the answer to one of those questions to win a copy of this book. Miralee Ferrell is an award-winning, best-selling author of 18 novels and a variety of short stories and articles. She and her husband live in the beautiful Columbia River Gorge in Washington State. 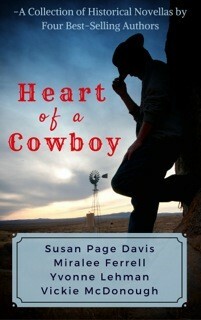 Her newest book, Heart of a Cowboy, released March first, and follows brave heroes and heroines of the Old West in a historic setting. She combined with three other authors, Vickie McDonough, Susan Page Davis, and Yvonne Lehman, to bring you a collection of four novellas. You can find it on Amazon and Barnes and Noble. No I have never done any of these things and sadly don't think I could handle it now. 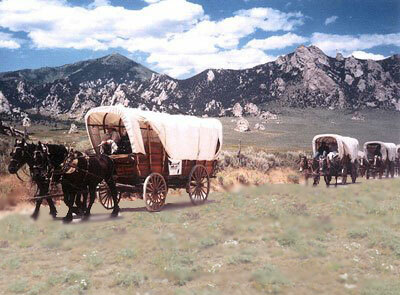 My uncle had a covered wagon and belonged to a group that would go on trail rides in the 1990's. Wendy, that's so cool! I'll bet your uncle had some great pictures and fun stories to share! I would love to experience something like this that took me back in time. I don't know that I could handle very long in a saddle, but I would love to get a taste of what it was like for people. Heather, I ride quite a bit in the spring-fall, but after two-three hrs I'm getting a bit sore. I don't think I could handle a full day ride, either. But it would be cool to try it! Wow, Heidi! That sounds much harder than a wagon train or horseback. I don't think I'd want to tackle that one. I honestly wouldn't want to do the covered wagons on hard, jouncy seats, either. Thanks for stopping by! My late husband and I loved history, and went on many trips. (all over the US) We have been to several ghost towns, etc. Laura Ingalls Wilder is my favorite author, and I have been to all the places she lived. I have taken a short covered wagon ride. I also read a lot of historical fiction books, as well as history books. It's all so interesting! Susanlulu, it sounds as though you've taken some fun research trips! I've never been to the place Wilder lived, but I'd sure love to. Thank you for stopping by! One of my dreams is to tour the west for several weeks. I don't know if it will ever happen, but I'm still hopeful. I know we writers glamorize life on the trail, but I do prefer my comfy car and a nice hotel room at night. I think most of us are wimps compared to the women who walked clear across the western states. Vickie, what I liked on the first one was that they don't camp overnight. They take you back to your hotel and pick you up the next morning. But I know I couldn't handle a full day of riding anymore, regardless. And it's my dream to visit dozens of historic sites and ghost towns someday when my hubby retires, but we'll see. I'm with you, Heather. I can only make 2-3 hrs nowadays, and don't think I could handle much more. But I love the idea! No, I've never had a chance to do any of these. I would enjoy visiting some ghost towns but I would probably choose traveling by motor vehicle. Not sure how my joints would survive an all day horse back ride! I loved reading this post! I've never done any of those things, but I'd love to be bored to death in a re-creation on the Oregon Trail via Conestoga wagon. How history could live! Of course, I might want to carefully choose my wagonmates!! Yes, that's for sure, Becky! It would definitely be tight living!!! I would like to see Bodie, CA ~ enjoyed online photos and my husband put carsiding on our ceiling, staining it nutmeg, and I love it! Shown in one of the buildings. Kathleen ~ Lane Hill House lanehillhouse[at]centurylink[dot]net would like to be entered to win your story! Bodie, CA, is one that's on my list to see as well. Looks amazing! Thanks for stopping by. That's neat you got to ride in a covered wagon. I've never done that. My grandmother actually moved in a wagon to S. Dakota when she was a little girl....it was in the early 1900's, but they didn't have a car, so used a wagon. Did your dad get pictures on his trip, Jennifer? How cool is that! And yes, I'd love the 5 day Earp trip as well. Very awesome history in there. I wish I had the pictures he took because I remember him showing them to me. My dad passed away 12 years ago and pryer to that my parents had divorced so allot of things were lost or taken by my dad's family. Just knowing those options are out there sets my heart to longing! As one commentor stated our ancestors were tough! I'm such a wimp compared to them! I'm right now planning a summer road trip from NY to Oregon but I can't drive more than an hour at a time because my body hurts too much. I've been speedy too much time in a recliner for the last two years due to illness and surgeries but I'm determined to get to 8 hrs a day driving. So for the next few months I'm driving almost every day increasing my time in the car so my body can adjust! I have trips planned to visit the surrounding states of CT, RI, MA, NY, ME, VT seeing historical sights and tourists stops, scenic views and a few hikes in the a White Mountains of NH where I currently live! Great idea, Cindy. And try walking for at least 30 min a day to get your muscles strengthened as well. That will also help with the driving. Yes, Connie, it takes a long time to work up to a full day without being very sore. But a covered wagon would definitely be easier....just bring your pillow to sit on that hard seat!! Thanks, Carrie, I'm the same way. My rear end and legs would be jello after 4 hrs or so. And my back would be trashed. But I'd sure love to see some of that stuff close up and personal from horseback!! Oh my that area is so close to my brothers and mom. I have seen the touristy area of Tombstone over 30 years ago. Sad bc my oldest brother and mom love in Sierra Vista only about 10-15 miles away. I'm in Indiana so haven't gotten much time to visit. I would love to take the horseback trails but don't think my legs could do more than a couple hours. Is there anything that you could take Mahon and then ride for a few hours? I'm so sorry to hear you haven't been able to visit for so long. I do hope you'll get a chance to see your family again soon...and maybe work in a trip to Tombstone while you're at it!! I didn't see a short ride on horses, only on wagons, and it wasn't in that specific area. I always wanted to go on a trail ride. We have several that come to Houston for the rodeo every February and lead a big parade through downtown Houston. That happened a week ago last Saturday. My brother-in-law leads trail rides in East Texas. The ones you describe sound like great fun. Think I'd do better in a covered wagon than on a horse now. Thanks for a delightful post, Miralee. Wouldn't it be fun if we could switch back and forth between a horse and a wagon when we need a rest? Then go back to a hotel for the night, LOL! I'm past wanting to camp out on the ground in a tent. I can't recall visiting a true ghost town but would love to. I may have ridden a covered wagon as a child but it was so long ago, I can't say for sure. I doubt I could make it on a cattle drive now because I have never been a real athlete. My health is decent but my body is not in shape for anything as strenuous as that. When I was a youngster, my family visited places like Ghost Town in the Sky at Maggie Valley, NC, but that's a far cry from a real ghost town. My siblings and I have loved the history of Wyatt Earp ever since we first saw the movies Wyatt Earp starring Kevin Costner and especially seeing Tombstone with Kurt Russell and Val Kilmer. It's still a family favorite to this day filled with lots of family bonding memories. I think it would be absolutely incredible to experience such an incredible post of history and his experiences in Tombstone. I'd love to experience an old covered wagon ride as well. Both of those sound amazing to me. Thank you for sharing this information with your readers!